INTRODUCTION: Family planning and contraception is the effective strategy to reduce maternal mortality, child mortality, abortion, and unwanted pregnancies. Since the medical students are the future doctors, it is important to have proper knowledge and training on family planning services. This study aimed to explore the effect of teaching-learning process at maternal and child health (MCH) clinics on the students' knowledge, perceptions toward contraception methods, and family planning counselling. METHODS: This quasi-experimental study was conducted in the private medical institution in Malaysia. The same questionnaire was used to administer twice, before and after the posting. Moreover, a qualitative question on the issues related to family planning and contraception utilizations in Malaysia was added to the after posting survey. The quantitative data were analyzed using IBM SPSS (version 20) and qualitative data by RQDA software. RESULTS: A total of 146 participants were recruited in this study. Knowledge on contraception method before posting was 5.11 (standard deviation [SD] ±1.36) and after posting was 6.35 (SD ± 1.38) (P < 0.001). Thematic analysis of the students' answer revealed four salient themes, which were as follows: (1) cultural barrier, (2) misconception, (3) inadequate knowledge, and (4) improvement for the health-care services. CONCLUSIONS: The teaching-learning process at the MCH posting has an influence on their perception and upgraded their knowledge. It also reflects the role of primary health-care clinics on medical students' clinical exposure and training on family planning services during their postings. Family planning service is one of the effective strategies to reduce the maternal and child mortality in the developing countries., Moreover, promotion of contraception could also contribute for the empowerment of women and enhanced their education in the society. As a long-term impact, family planning is essential to reduce the unsustainable population growth, to improve the socioeconomic status, and to achieve the regional and national goals. The modern contraceptive methods, such as oral contraceptive pills (OCPs), injections, intrauterine devices (IUDs), and sterilization, were promoted to be utilized worldwide and 90% of married or in-union women contraceptive users utilized modern methods in 2015. The long-term methods of female sterilization and intrauterine contraceptive device were most commonly used methods globally, and followed by the pills, male condoms, and injectables. However, the prevalence of each of the modern method was varied throughout the world. Therefore, ensuring the accessibility and availability of preferred methods for the family planning is essential to promote the utilization rate and to reduce the unmet need gap. In Malaysia, the contraceptive prevalence rate (CPR) of modern methods was 41.7% and still existing gap of unmet need of 15.4% in 2015. The unmet need might lead to the unintended pregnancies and unsafe abortion. According to the Malaysia law (Section 312, Penal Code), termination of pregnancy is only permitted for the women, where “pregnancy poses a risk to the life of the pregnant woman or is injurious to the physical and/or the mental health of the pregnant woman.” In addition, abortion is still a taboo and limited accessibility to abortion services are encountered in Malaysia. For that reason, provision of contraception is the best preventive strategy to reduce adverse consequences of unsafe abortion. To improve the quality of contraception services, medical eligibility criteria (MEC) for contraceptive use was developed to provide the guidance for contraceptive choice. Knowledge of the medical students of family planning methods and eligibility criteria is important as they are future doctors to provide safe, effective methods, and individualized to each patient. Training of the medical students at the primary health-care clinics aimed to achieve the improvement in theory knowledge, clinical skills, and to have positive impact on their perception and attitudes toward the services and community. In this study, the final-year medical students learned about family planning services and contraception by passive learning (i.e., clinic teaching by the lecturers and nurses), active learning (i.e., the students' presentation during tutorial session), and the hands-on experience for counselling sessions, advices, and provision of contraception methods during their 3-week posting at Maternal and Child Health (MCH) clinics in Malaysia. A quasi-experimental study (before and after) was conducted in the private medical institution in Malaysia. The final-year participants were recruited using purposive sampling method at the beginning of the MCH posting. A total of 146 students participated after getting their verbal consent. Each participant was given a code number to conduct the anonymous survey, which was coded in both before and after posting self-administered questionnaire. The data were collected from April to September 2017. The modified survey questionnaires were prepared based on a similar study conducted in India. The questionnaire was sent to the experts and suggested corrections were made. The final questionnaire included four domains: the first domain was “Demographics,” which included students' batch, age, gender, marital status, nationality, ethnicity, religion, and place of birth. The second domain was “Perception of family planning services training” which focused on the students' perception on the topic of family planning in the study program, self-assessment of participants' theoretical knowledge on family planning, and the clinical practice experience during the MCH posting. The third domain was “Perception of contraception counselling,” which enquired the students' perception on suitable counselling approach, suitable person for counselling, and important characteristics during counselling session. The fourth domain is “Knowledge on contraception methods,” which included questions testing their knowledge on the WHO's MEC for contraceptive use, OCPs, emergency contraceptive pills, barrier methods, and traditional methods. A total of 11 questions were included in the fourth domain. Regarding their knowledge assessment, score 1 was given for the correct answer and 0 was given to the incorrect answers. The total scoring was ranging from 0 to 11 for each participant. The knowledge level of the participants was categorized according to the total score as good (8–11), moderate (4–7), and poor (0–3). The same questionnaire was administered twice to each of the participants, the first time was during the briefing session at the beginning of the MCH posting and the second time was at the end of the 3-week posting. In the after-posting survey questionnaire, the students were asked to mention the issues related to family planning and contraception utilizations in Malaysia. The researchers used the open-ended question to explore their opinions and experiences on barriers during their posting. The qualitative data from the after-posting survey regarding the issues related to the contraceptive utilization is entered to text files and imported to R package for Qualitative Data Analysis (RQDA) software. Thematic analysis was done using RQDA software. Two separate researchers had done the data analysis independently to code and to deduce the themes from the qualitative data. A total of 146 final-year medical students were participated in this survey. The demographic characteristics of the participants were shown in [Table 1]. The mean age of the participants was 23.70 with standard deviation (SD) of ± 2.176. Among the participants, 62 (42.5%) were male and 84 (57.5%) were female. Malay ethnic group was the highest among the participants, 55 (37.7%). Majority of the students are local Malaysian, 142 (97.3%). The place of birth of most of the students was urban area 117 (81.8%) and 138 (97.2%) of participants were single [Table 1]. The students' perception of family planning and contraception training were investigated in this study. Approximately half to the participants (54.8%) admitted that they have sufficiently trained for family planning and contraception before the posting. After then, it was dramatically increased as the majority of participants (91.1%) reported that they received sufficient training after the MCH posting. When the researchers enquired about self-assessment of their knowledge on contraception, more than half (56.3%) of the participants admitted that their knowledge was fair before posting, nevertheless, 80.8% of the participants disclosed their knowledge was good to very good after the posting. Regarding the clinical practice to family planning and contraception services, 65.8% of students agreed that they had clinical exposure on this topic before the MCH posting, and the percentage of students agreed was increased to 81.4% after the posting [Table 2]. Regarding the students' perception of contraceptive counselling for the women at the primary health-care clinics, majority of the students would like to conduct the individual counselling which was 80.8% of participants before the posting and 88.4% after the posting. Before MCH posting, the students perceived that the doctors should provide family planning counselling section, which was 82.2% of participants. However, after the posting, the students were aware of the role of nurses in the clinic and the percentage of students who agreed the nurses as the suitable counselor increased from 5.5% before posting to 15.1% after the posting. The importance of privacy and confidentiality during contraceptive counselling consider as priority by 64.4% of participants before posting and 84.3% after posting. This question included multiple responses and the participants were asked to choose the most important to the least important by giving score from 1 to 8. The responses were privacy, confidentiality, take sufficient time for counselling, helpful manner, keep it simple, use visual aids, first thing first to avoid confusion to patients, and repeat the explanation [Table 3]. The knowledge score of the students was assessed and categorized as the poor and good knowledge on contraception methods. The mean knowledge score of the students before posting was 5.11 (SD ± 1.36), then which was improved to 6.35 (SD ± 1.38) after posting (P < 0.001). However, the mean scores for both before and after posting were still within the moderate category [Figure 1] and [Table 4]. A total of 126 students responded the open-ended question using their own words during the after posting survey. The response rate of the students on this qualitative question was 86.3%. The students shared the issues related to the family planning services and contraception utilization in Malaysia. Thematic analysis of the students' answer revealed four salient themes, which were (1) cultural barrier, (2) misconception, (3) inadequate knowledge, and (4) improvement for the health-care services. The students stated that misconception about the side effects of modern contraceptive methods were barriers for the women to use the birth spacing methods. The family planning was included as a national policy in Malaysia since 1966, since then CPR had been increased to 52% in 1984. However, in the next three decades, the CPR remained stagnant around 50% in Peninsular Malaysia. Although the government was implementing the strategies to improve access to the family planning services, the unmet need for modern contraception methods was 36% in 2004. In order to provide the better family planning services to community, the medical students should have competent knowledge on the family planning and contraception methods. This study was conducted to assess the changes in students' perception and knowledge on family planning and contraception before and after MCH posting. In the study institution, the final-year medical students were posted at MCH clinics for 3-week duration. Freeman et al. defined the working definition of active learning as “active learning engages students in the process of learning through activities and/or discussion in class, as opposed to passively listening to an expert. It emphasizes higher-order thinking and often involves group work.” In our study, the students presented the family planning and contraception topic during the tutorial session, which was followed by the active discussion with the classmates and the facilitator. Moreover, the students received the clinic teaching on the knowledge of contraception methods by the lecturers and nurses. After that, the students were allowed to observe and participate to have the hands-on experience of handling the cases for contraception methods provision and counselling sessions. The students' perception on this training process for family planning services were investigated in this study. Approximately half to the participants (54.8%) before the posting and the majority of participants (91.1%) after the posting reported that they received the sufficient training after the MCH posting. This finding is in line with a cross-sectional study conducted among medical students in India where 73.9% of students consider sexual and reproductive health included in their curriculum sufficiently. 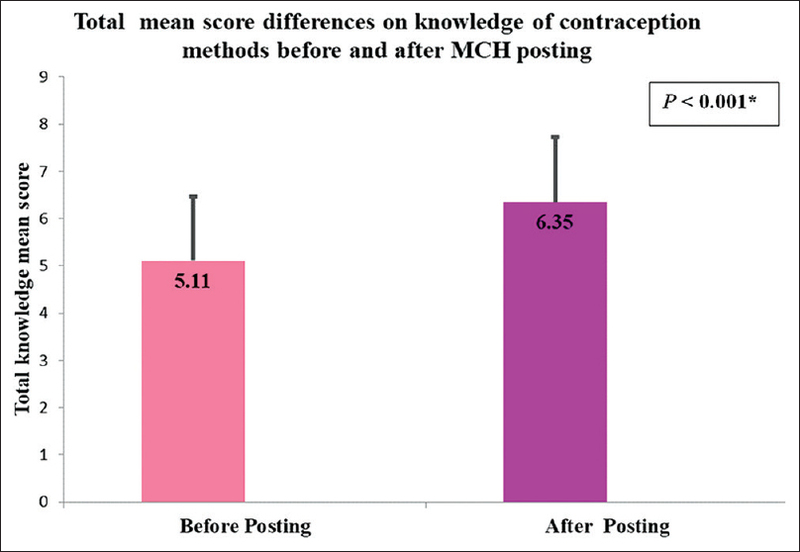 Regarding the self-assessment of their knowledge on contraception, the students who admitted that they have good to very good knowledge of contraception had increased from 56.3% before posting to 80.8% after posting. Ideally, the self-assessment should reflect and have strong relationship with their real performance. However, in reality, the validity of the self-assessment is controversy and the students were more likely to overrate their scores in most of the studies. However, in our study, the same students rated themselves before and after posting. The improvement of their self-assessment before and after the posting reflected the positive impact of learning process during their study period. The clinical observation and exposure with real patients was the given opportunity to the final-year students at the primary health-care clinics. Therefore, 81.4% of students agreed that they had clinical exposure on contraceptive services after the posting. A study conducted in Bahrain suggested that the primary care clinics were the ideal centers for the medical student training in order to improve the clinical skills. In our study, the students admitted that they gained the clinical experience in the MCH clinics and which could have the benefit on their clinical proficiency when they continue their career in the future. Antenatal and postnatal scheduled visits are the opportunity for the health-care providers to discuss about the family planning and contraception counselling with the pregnant women and mothers. In the primary care centers in Malaysia, contraception counselling usually offers during the third trimester of antenatal visits, providing the time for the pregnant women in order to consider and discuss with their spouse. During the postpartum home visits and clinic follow-up visits, they can decide and initiate utilizing the suitable contraceptive methods. In this study, majority of the students would like to conduct the individual counselling to discuss about the family planning and contraception, that is, 80.8% before and 88.4% after the posting. This finding is in line with the study conducted among the medical students in India where 74% of participants preferred to provide individual counselling rather than group counselling to maintain privacy. Before MCH posting, 82.2% of the students perceived that the doctors should provide family planning counselling section. The WHO recommended the task sharing of family planning services among the medical doctors, midwives, and nurses in order to increase accessibility., During the clinical posting, the students were aware of the role of nurses at the primary care clinics. Therefore, the percentage of students who suggested for the task sharing with the nurses as the counselors increased from 5.5% to 15.1% before and after the posting. However, majority of them still consider as medical doctors are the most responsible authority for contraceptive counselling. Throughout the counselling session, maintaining the privacy and confidentiality is essential to control the information and not to disclose without getting consent from the patient., Our study participants were aware of the fact and the percentage of students giving priority to privacy and confidentiality was increased from 65.2% to 84.8% before and after posting. However, the remaining students considered the helpful manner, making it simple and using the visual aids were the important characteristics to become effective contraceptive counselling. The medical students' knowledge on the WHO MEC for contraceptive use, modern contraceptive methods (such as pills, injections, and condoms) and traditional contraceptive methods (such as rhythm and withdrawal) were assessed and given the scores for the correct answers. The mean knowledge score was improved from 5.11 (SD ± 1.36) to 6.35 (SD ± 1.38) after posting (P < 0.001). Similar finding revealed in the meta-analysis of 225 articles on learning process revealed that the active learning process enhanced the students' engagement and performance in the examination. However, the mean scores of the participants for both before and after posting were still within the moderate category. The finding of a study conducted among the postgraduate students including health science, science, and nonscience programs in Malaysia also revealed that reproductive health knowledge among the participants was unsatisfactory. Source from the study among pharmacy students in Malaysia also pointed out that although the overall knowledge, awareness, and perception on the contraceptive was good, the in-depth knowledge on contraception methods are still lacking among the participants. Therefore, the contraception educational programs should be emphasized in the curriculum and translation of the knowledge in the clinical practice should be encouraged by providing more clinical exposure to the medical students. 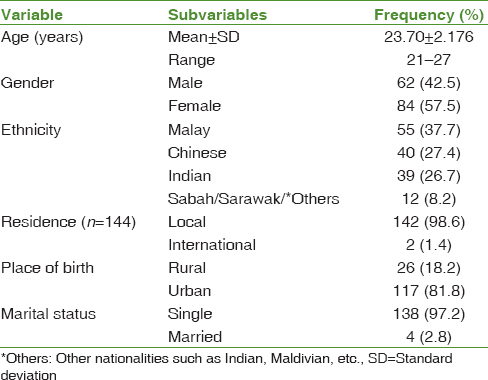 The family planning utilization was hindered by several social and cultural issues in Malaysia. In our study, the students shared the important issues related to the family planning services and contraception utilization which were (1) cultural barrier, (2) misconception, (3) inadequate knowledge, and (4) improvement for the health-care services. The cultural barriers such as considering sexual, reproductive health and contraception as taboo topic, conservative, and shyness to seek for the contraception and involvement of husband and in-laws in decision-making reduce the utilization of modern contraceptive methods. Inadequate knowledge on the modern contraception methods and misconception of side effects such as the increased risk of cancer and infertility in the future were concerns for the women to initiate usage of contraception. Similar findings were disclosed in a qualitative study conducted among the women in Malaysia, in which the participants confessed that they were surrounded by cultural norms, fears, and misconception of side effects to utilize the modern contraception methods. Another study conducted in Kelantan found out that the women are still having inadequate knowledge on family planning, especially in the rural areas. Proper communication with the spouse for contraception usage and promoting the educational programs for modern contraceptive methods might improve the knowledge and utilization of contraception among the women in Malaysia. As the family planning and contraception is the important strategy to reduce the unintended pregnancies, maternal and child mortality, the effective counselling and services should be accessible to every woman As the medical students are the future health-care providers, they should have competent knowledge, positive attitudes, and perception toward the contraception services. In our study, the teaching-learning process was found to have influence on their perception and improved their knowledge among the participants. However, the participants' knowledge on family planning and contraception methods was within the moderate level. Therefore, clinical exposure and training on family planning services at primary health-care clinics should be encouraged to produce competent doctors and better serve to the community in the future. We would like to express our gratitude to Research Ethical Committee and Management of Melaka-Manipal Medical College (MMMC) for providing approval to conduct this study (MMMC/FOM/Research Ethics Committee- RP8/2017). We would like to thanks to students from MBBS, without their participation, this study would not have been possible. Cleland J, Bernstein S, Ezeh A, Faundes A, Glasier A, Innis J, et al. Family planning: The unfinished Agenda. Lancet 2006;368:1810-27. World Health Organization: Family Planning/Contraception. World Health Organization; 2018. Available from: http://www.who.int/mediacentre/factsheets/fs351/en/. [Last accessed on 2018 Feb 20]. United Nations: Trends in Contraceptive Use Worldwide 2015; 2015. Available from: http://www.un.org/en/development/desa/population/publications/pdf/family/trendsContraceptiveUse2015Report.pdf. [Last accessed on 2018 Feb 20]. Tong WT, Low WY, Wong YL, Choong SP, Jegasothy R. Exploring pregnancy termination experiences and needs among Malaysian women: A qualitative study. BMC Public Health 2012;12:743. World Health Organization: Medical Eligibility Criteria for Contraceptive Use. 5th ed; 2015. Available from: http://www.apps.who.int/iris/bitstream/10665/181468/1/9789241549158_eng.pdf. [Last accessed on 2018 Feb 20]. Gopalakrishnan S. Community medicine: Learning experience of medical students. South-East Asian J Med Educ 2010;4:46-7. Hogmark S, Klingberg-Allvin M, Gemzell-Danielsson K, Ohlsson H, Essén B. Medical students' knowledge, attitudes and perceptions towards contraceptive use and counselling: A cross-sectional survey in Maharashtra, India. BMJ Open 2013;3:e003739. Ahmad N, Peng TN, Zaman KF, Sapri NA, Manaf MA, Kim YY. UNFPA – ICOMP REGIONAL CONSULTATION: Family Planning in Asia and the Pacific Addressing the Challenges – Status of Family Planning in Malaysia; 2010. Available from: http://www.icomp.org.my/new/uploads/fpconsultation/malaysia.pdf. [Last accessed on 2018 Feb 20]. Dunning D, Heath C, Suls JM. Flawed self-assessment: Implications for health, education, and the workplace. Psychol Sci Public Interest 2004;5:69-106. Boud D. Part II Examples of Practice, Enhancing Learning through Self-assessment. Abingdon, Oxon: Routledge; 2013. p. 72-88. Alnasir FA, Jaradat AA. The effect of training in primary health care centers on medical students' clinical skills. ISRN Fam Med 2013;2013:403181. Glazer AB, Wolf A, Gorby N. Postpartum contraception: Needs vs. reality. Contraception 2011;83:238-41. Mbizvo MT, Chou D, Shaw D. Today's evidence, tomorrow's agenda: Implementation of strategies to improve global reproductive health. Int J Gynaecol Obstet 2013;121 Suppl 1:S3-8. Jacobstein R, Curtis C, Spieler J, Radloff S. Meeting the need for modern contraception: Effective solutions to a pressing global challenge. Int J Gynaecol Obstet 2013;121 Suppl 1:S9-15. Ensuring Privacy and Confidentiality in Reproductive Health Services: A Training Module and Guide. Washington, DC: PATH; 2003. https://www.path.org/publications/files/RH_ensuring_privacy.pdf. [Last accessed on 2018 Feb 20]. World Health Organization. Considerations for Formulating Reproductive Health Laws; 2000. Available from: http://www.apps.who.int/iris/bitstream/handle/10665/66223/WHO_RHR_00.1.pdf; jsessionid=F67D17B2763CF41F4CAF7A0A19B20649?sequence=1. [Last accessed on 2018 Feb 20]. Soleymani S, Abdul Rahman H, Lekhraj R, Mohd Zulkefli NA, Matinnia N. A cross-sectional study to explore postgraduate students' understanding of and beliefs about sexual and reproductive health in a public university, Malaysia. Reprod Health 2015;12:77. Elkalmi RM, Khan MU, Ahmad A, Srikanth AB, Abdurhaman NS, Jamshed SQ, et al. Knowledge, awareness, and perception of contraception among senior pharmacy students in Malaysia: A pilot study. J Res Pharm Pract 2015;4:94-8. Najafi F, Rahman HA, Juni MH. Barriers to modern contraceptive practices among selected married women in a public university in Malaysia. Glob J Health Sci 2011;3:50-55. Bachok N, Abdul Razak A, Ismail N, Hamzah T. Acceptance and knowledge of family planning among Muslim women in rural villages of Kelantan. JIMA 2007;39:109-16. Najafi-Sharjabad F, Rahman HA, Hanafiah M, Syed Yahya SZ. Spousal communication on family planning and perceived social support for contraceptive practices in a sample of Malaysian women. Iran J Nurs Midwifery Res 2014;19:S19-27.